PIE continued its steady performance in April. A reminder: we are trying to maximize risk-adjusted returns, as opposed to absolute returns - so we expect to under-perform the markets in times when markets happen to be sharply up. Moreover, since April was a very strong month in historical terms for stock markets around the world, we definitely didn't expect to outperform. Surprisingly, PIE managed to slightly outperform (in absolute terms) in the past 4 weeks, because its steady returns kept compounding. As you can see from the table above, SPY was stronger than PIE in the 1st two weeks of the past 4, but down in the 3rd week, and overall much less consistent. Consistency pays, and steady wins the race. In mathematical terms, the maximum product of 4 quantities whose sum is a constant C, is obtained when all 4 quantities are equal to C/4. Having steady returns is of great importance in the long run because these returns compound. Since PIE variance is so much lower (StdDev was about half than SPY in the past 4 weeks), and the mean weekly return slightly higher, It has been a clear winner in April. The bottom line -- looking at the line item that we care about the most: PIE has done over 2.2 times better than SPY (2.590206/1.173009 = 2.208172) in the past 4 weeks on a risk-adjusted basis. Looking at a longer time period, since January 2009, the markets started the year on an abysmal note with sharp declines in January and February. PIE's weekly volatility has been less than 1/7th (0.1361) of SPY's, year to date on a weekly basis. Another way of looking at this steadiness: PIE was up in 14 out of 16 weeks since I started tracking it, and it just happened to be up in each and every day of the last week -- a very rare occurrence. Running a F-test [wikipedia article] on the two weekly return series (SPY vs PIE) since January shows a virtually nil probability of 0.00000000794 (7.94e-9) that the two vectors of weekly returns were drawn from the "same population." This means that in statistical terms, the chances that PIE has been superior only "by chance" has been practically rejected now that we have a big enough sample of weekly returns. The simplified [*] and "monthualized" [**] Sharpe ratio of PIE's weekly returns Year to date (2009), now stands at 2.9589, compared to -0.0188 for SPY. PIEs steadiness and very high Sharpe ratio, are its greatest virtues. There are other virtues which I may cover in future columns. Sharpe ratio [wikipedia article] is calculated by dividing the mean of PIE's weekly returns by the standard-deviation of these weekly returns. Since interest rates on Money Market accounts these days are close to 0% anyway. Because PIE's annualized returns of over 50% (based on 16 weeks) make the risk-free rates negligible anyway. monthly-returns (1 sample per month) is the hedge-fund industry standard, i.e. the way the financial industry calculates it. In order to be able to compare apples to apples, I multiply the weekly sampled risk-adjusted ratio (Simplified Sharpe) by sqrt(21/5). Since there are 5 trading days in a week and 21 trading days in a month and since volatility decays as a square-root of the time. IOW: monthly sampled Sharpe ratios look about sqrt(21/5), or 2.0493 better than weekly sampled ones so we need to normalize. The UpDown proxy account for PIE performed well too, though not as good as PIE's real account. This is expected since I care less about it and often perform shadow trades after a time lag and giving less attention to detail there. I keep spending occasional time on UpDown because of the importance of having an independent 3rd party audit of sorts. 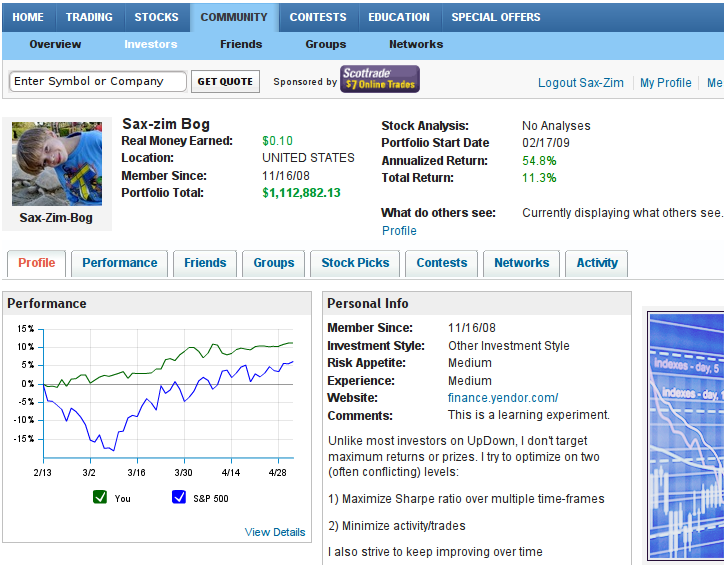 The following screen shot shows the steadiness of the UpDown account and its consistency. The annualized return is now down to 54.8%. Note that this record starts around mid February rather than at the beginning of 2009 so it shows only 11.3% overall return compared to over 15% in the real PIE trading account.